A roundtable discussion on the “Maritime Security in the Indian Ocean: Challenges and Prospects for Pakistan” was organized by the Centre for Pakistan and Gulf Studies (CPGS) in collaboration with the Konrad Adeneur Stiftung (KAS) at the Serena Hotel Islamabad. 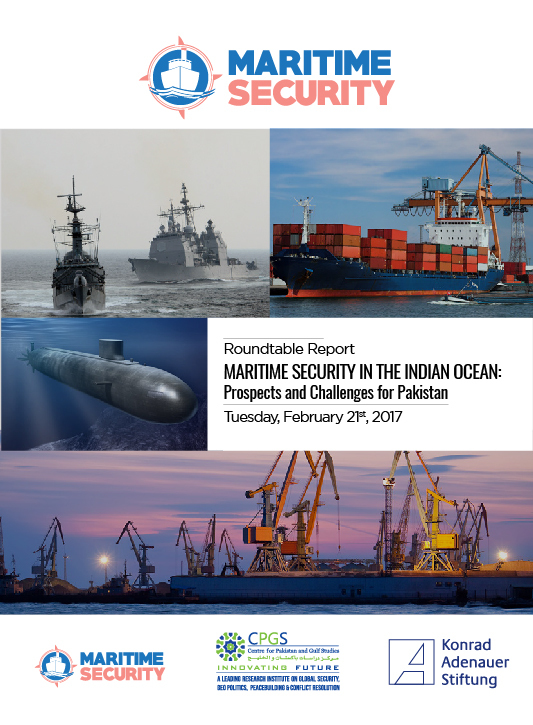 It was chaired by the Former Chief of Naval Staff Admiral (R) Asif Sandila NI(M) HI(M). Speakers for the event included Dr Azhar Ahmad, Head of the Department of Humanities and Social Sciences at Bahria University, Islamabad and Mr Zaheeruddin Dar, Chief Executive, Centre for Social Education & Development, Islamabad. The event is first in the series of initiatives launched by CPGS under the auspices of the Centre’s project on ‘Maritime Security’.